Project Articles shows all stock articles and articles purchased to projects and how they are used. Articles can be used on bill of materials, shipments or transferred to stock. Actions shows shortcuts to functions in Project Articles. - Delivery Date: Used to determine when an article is to be available on the project stock. - Tag: Can be filled in, if the article must be tagged for traceability. - Qty: Number of articles to be used in the project. - Available: Shows how many articles are available in stock. - Stock Size Calc: Shows the stock size converted to the unit of the article type. - Unit: Shows the articles consumption unit. - Stock No: Article stock no. - Description 1/Description 2: Shows the formula result of the article based on the article type, including static and dynamic properties. If no formulas are used, the description is entered manually in the stock module. - Next and Finish will close the wizard. The stock articles are now reserved from stock and are now awaiting physical movement to the project. The movement must be registered in the module Relocation. Cancel Reserve: Is used to cancel a reservation from stock. 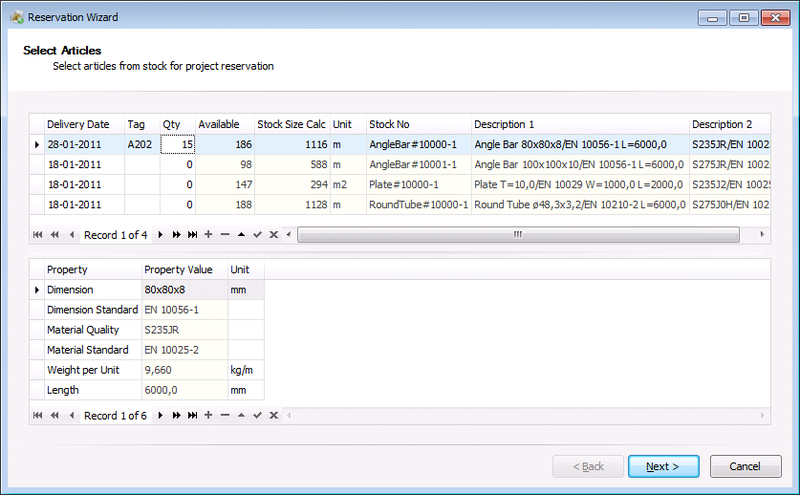 A reservation can only be cancelled, if it is not yet moved to the project stock via the Relocation module. If the article is to be moved back to stock, it must be unchecked (moved back) in the Relocation module before it can be cancelled. Stock Revert: Is used to move surplus articles back to stock. If the number of articles on multiple lines is not matching the desired consumption, articles can be moved back to stock with the stock revert function to later transfer articles with the stock reserve function. Cancel Revert: Used to cancel a stock reversion, which is possible until the article is moved to stock through the Relocation module. Print Articles: Prints a list of articles to the default printer. - When an article is purchased to a project in the module Purchase, the status is Purchased. When the article is received in the module Reception, the status will be Purchase and Received. - When an article is reserved from stock in the module Project Articles, the status is Reserved. When the article is moved through the module Relocation, the status will be Reserved and Received. Article No: Show the article template no or the stock article no. Available: Shows how many articles are available for bills of materials or shipments. In Use: Shows how many articles are used on bills of materials and shipments. Reverted: Shows how many articles are transferred/reverted back to stock. Qty: Shows the total number of articles, which is the sum of articles in the columns Available, In Use and Reverted, which represents the total number of articles purchased or reserved from stock. Qty Calc: Shows the Qty converted to the unit of the article type. Unit: Shows the unit type of the article. Yellow = Article are not received and delivery date is today. Red = Article are not received and delivery date is earlier than today. Res No, Date, Available Date, Location, Tag, and Comment: Reservation information. Purchase No, Ln No, Date, Available Date, Location, Tag, Comment, Supplier, Contact, and Phone: Purchase information. Price Per Unit: Shows the price per unit. Price: Is a calculated field and shows the price for the Project Article Line. If there is a price on all articles the total project price will appear in the title line of the project. Weight Per Qty (kg): The weight of one stock article. Weight (kg): Total weight of the articles. 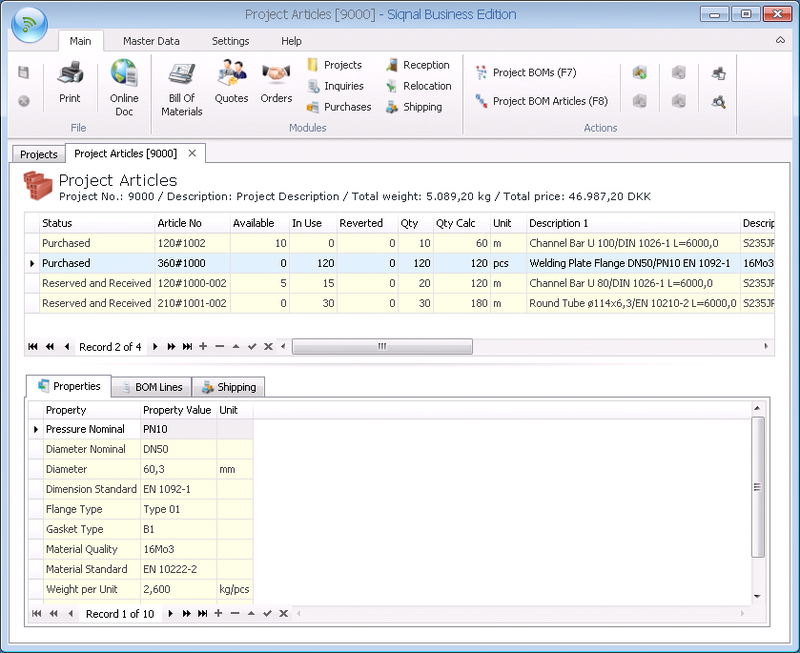 If there is a weight on all articles the total project weight will appear in the title line of the project. Shipping tab: Used to ship articles. 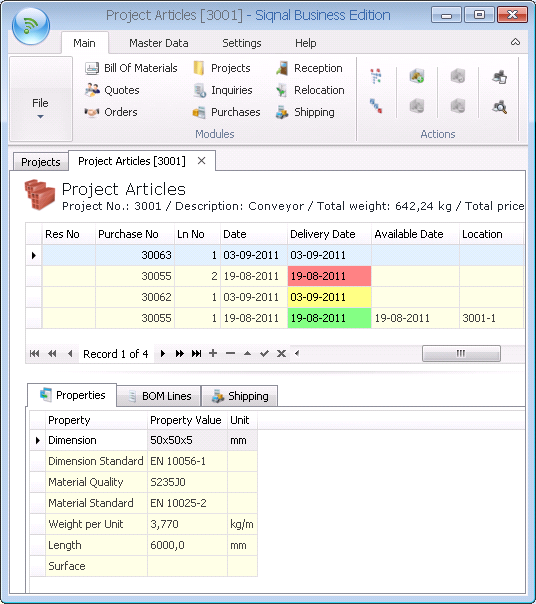 A project shipment must be created in the Shipping module to enable shipments from Project Articles. - Qty: Number of article to ship. - Shipping No: The shipment not that is to be used; is selected from a drop-down list based and shows shipments available for the project. - Delivery Date: Shows which date the article must be available at the shipment recipient. - Picked Date: Shows when the articles were picked and made ready for shipment. - Picked By: Shows which employee picked the articles from the project stock. - Shipping Date: Shows when the articles were shipped. - Shipping By: Shows which employee shipped the articles.